And shattered with a jerk. Affectionate childhood memories of Turkish Taffy — I remember only the vanilla variety — hard and soft at the same time, pleasantly sweet and chewy. Its relationship to (salt-water) taffy was unclear to me (beyond their both being chewy candy), and I had no idea what made the stuff Turkish (the presumably Ottoman minaret on the package might just be imaginative marketing). So: about the candy; about the name and its semantics; and a bonus bit about Bonomo’s Magic Clown (on tv when I was in my teens). Turkish Taffy was invented in 1912 by Austrian immigrant Herman Herer, who sold the rights to M. Schwarz & Sons of Newark, New Jersey, which were acquired in 1936 by Victor Bonomo, a Sephardic Jew whose father, Albert J. Bonomo, had emigrated from Izmir, Turkey and founded the Bonomo Company in Coney Island, New York in 1897 to produce saltwater taffy and hard candies. According to Tico Bonomo, son of Victor, Turkish Taffy “was not really a taffy, but what is technically known as a short nougat,” consisting of a batter of corn syrup and egg whites that was cooked and then baked. It was also not Turkish, but created after World War II in the Bonomo factory. It has been marketed in vanilla, chocolate, strawberry and banana flavors. Turkish Taffy was originally sold in large sheets to Woolworth’s stores, where pieces were broken off with a ball-peen hammer at the counter and sold by weight. In the late 1940s the company released a version in candy-bar size which the purchaser could whack against a hard surface to break into bite-sized pieces. This property of being shattered or broken by sudden shock, but still pliable and soft when chewed is possible because the candy is a non-Newtonian fluid. Since the pieces were both chewy and slow-melting in the mouth, it was a favorite for the frugal customer. A bar still cost 5¢ in the 1960s. By that time, it was marketed by Gold Medal Candy Corporation of Brooklyn, New York. In 1949 Turkish Taffy became one of the first forms of candy advertised and marketed on television, when Bonomo created and sponsored The Magic Clown on NBC Television. Tico Bonomo specifically cited the decision to use television as instrumental in the popularity of the candy-bar sized taffys. In 1980 the candy became part of the Tootsie Roll Industries of Chicago line of candies, and it was discontinued in 1989. The semantics. Turkish Taffy is not taffy, and it’s not Turkish. noun taffy: North American a candy similar to toffee, made from sugar or molasses, boiled with butter and pulled until glossy. 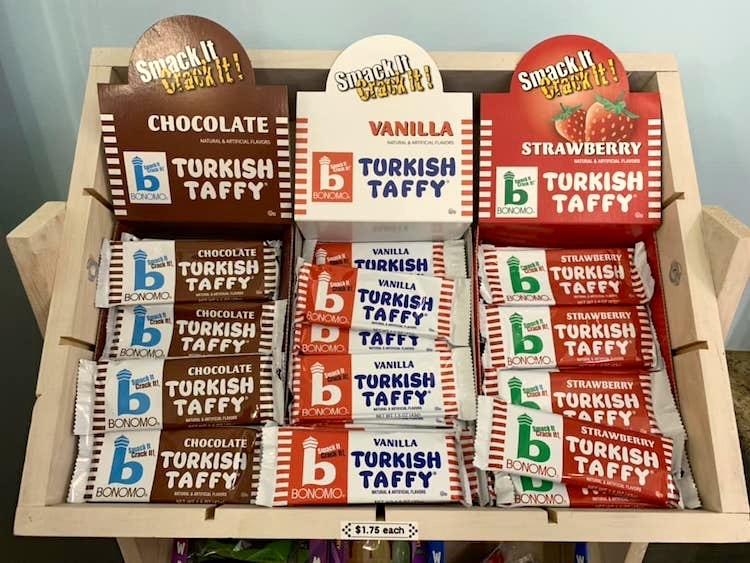 The association of Bonomo Turkish Taffy wth Turkey comes in two steps: the candy is associated with Victor Bonomo by virtue of his being its manufacturer, and Bonomo is associated with Turkey by virtue of his family descent. Bonomo was Turkish in the way that I’m Swiss, and then his candy was Turkish because it was made by someone Turkish — well, someone who thought of his roots in Turkey as being a significant fact about him (though Bonomo was American, as I am). 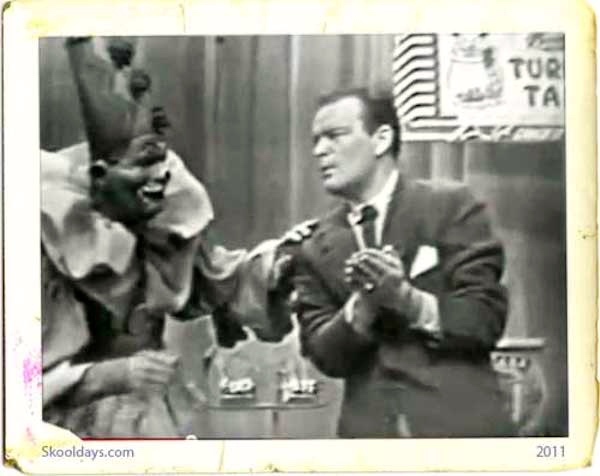 The Magic Clown is an NBC TV series which ran from 1949 to 1954. The final NBC broadcast was on June 27, 1954. The show then moved to WABD [a DuMont station] where it stayed until 1958. After that, it was renamed Bonomo, The Magic Clown and was broadcast on WNTA [owned by National Telefilms Associates] from September 29, 1958 to July 24, 1959. The show was sponsored by Bonomo Turkish Taffy. Josh Norris, who used the stage name “Zovella”, was the first Magic Clown [there were several], and went on to a successful career as a full-time magician. Much as I liked Turkish Taffy, I detested clown shows for kids as a genre, and found this one especially creepy the couple of times I tried to watch it. So I have no lustrous childhood memories of it to regale you with. This entry was posted on October 23, 2018 at 3:32 pm and is filed under Language and food, Movies and tv, My life, Semantics, Subsectivity. You can follow any responses to this entry through the RSS 2.0 feed. You can leave a response, or trackback from your own site.